Habitat: Prefers cold/clear streams for spawning and deep/sheltered pools in winter. Range: Native to British Columbia’s upper Columbia River system, northern tributaries of Snake River, and North Central Idaho. Several streams (Cayuse Creek, Kelly Creek and their tributaries, along with White Sand Creek, Weir-Post Office Creek, and others) in Clearwater Basin have established catch-and-release regulations that have enhanced/protected population. Reproduction: Require flowing water to spawn successfully; optimal temperatures 40 – 49 degrees F. Peak spawning can occur as late as mid-October – early November. Most spawn annually after reaching maturity; can successfully spawn over variety of river bottoms. 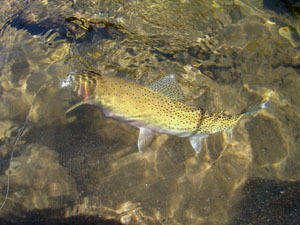 Threats: Pure Westslope-cutthroat extirpated throughout most of historic range. Existing populations threatened from logging, road-building, grazing, mining, urban development, agriculture/dams, and introduction.hybridization with non-native hatchery species. Various campaigns have encompassed support from scientists, conservationists, historians, sport-fishing communities, and Native American and ranching communities. Officially classified as “Species of Concern” by Region 1 Forest Service. Miscellaneous: Requires clean/cold water for survival, and secure connected habitat (tributaries and main stems), as well as protection from introduced nonnative fish. Subspecies in danger of hybridization and may be extirpated from Northern Rockies without region wide, long-term effective protection and recovery effort. Has the trinomial name Oncorhynchus clarkii lewisi, in honor of Lewis & Clark Expedition, who discovered subspecies at “Great Falls of the Missouri” in Montana.